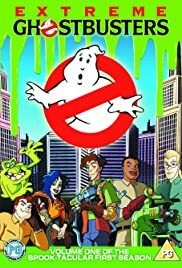 Ray, Winston and Venkman return for Egon's birthday celebration and decide to bust some ghosts just for nostalgia's sake. Episodes feature the Ghostbusters as well as their secretary Janine. But the main star of this show is their pet ghost Slimer, who's joined by some new friends and some new enemies. Garrett Miller: New York, New York. The town so nice, they named it twice. "Extreme Ghostbusters" was a really a good series. I used to watch it Sunday mornings when I was young. I was very fond of this show and I enjoyed watching it. I also enjoyed watching "Real Ghostbusters". My favorite character was Slimer. He was cute and funny. I also liked Kylie Griffin because she was cool and Egon Spengler because he was one of the original ghostbusters. My favorite episode was the two part saga when the original ghostbusters visited the new ghostbusters. It was good seeing the old guys again. I also liked the episode with the Jersey Devil. That episode was a little scary. Another good episode was "The True Face of a Monster". Overall I really enjoyed this show and I was sad to see it leave. I give this show 9/10 stars. 260 of 261 people found this review helpful. Was this review helpful to you?